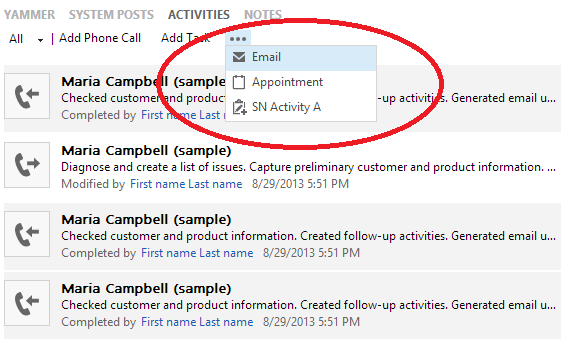 The activity feed is the first thing you see when you view records in CRM, whether it’s an opportunity, lead, account, contact, or service case. On the activity feed, click the dots (…) to see a menu that lists your options. After clicking an item, you can create one (with some of the info already pre-populated for you). Save – saving an activity lets you stay on the same page, so that you can take any action (like marking it complete, deleting, closing, or converting to opportunity or case). You can use the browser back button to go back to your activity feed at any time. Mark complete (or Send for email) – This action takes you back to your activity feed since there seems to be nothing much left for you to do. 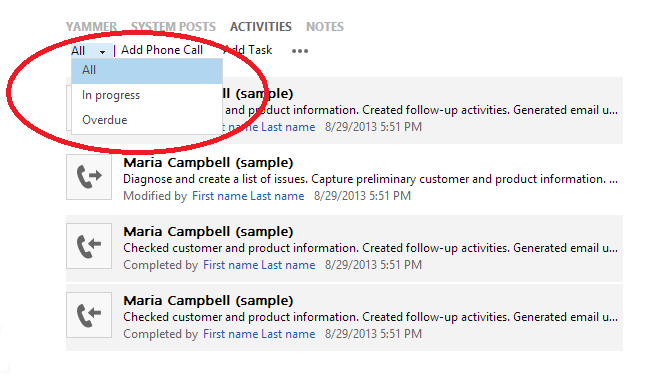 I am sure you’re excited to hear about this new feature, and are going to head back to CRM right now and start creating lot of activities. Oops! Now you have a different problem because your activity feed looks too messy since you created a lot of activities and there seems to be no way to look at the just important ones. Never fear. We endeavor to anticipate your pain points, and came up with a solution. There are three filters for the activity feed. All – This is actually not a filter, which means that it shows all the activities without filtering any of them. This is also the default filter. Activities are listed in order by the date they were modified, with the most recent at the top. In progress – This filter shows activities that are in progress (not complete or closed). In-progress activities are also listed in order by the date they were modified, with the most recent at the top. Overdue – This filter shows activities that are in progress, as well as those with a due date set in the past. Overdue activities are listed in order of their due date, with the earliest due date on the top. Note that time zone used by the filter here is UTC and not the user’s time zone. This means that if an activity has passed its due date in your time zone but not in UTC, then that activity isn’t listed under overdue activities, and vice versa. We hope your experience with activities is much better with these changes. Stay tuned for more upcoming enhancements! !